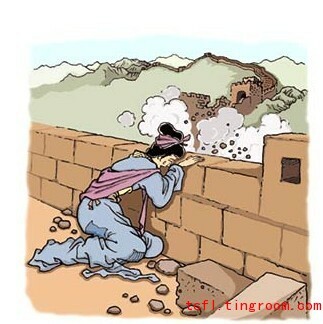 The legend of "Meng Jiangnv bringing down the Great Wall with her tears" is a famous folktale of ancient China. Operas, ballads, and musical narrations etc featuring this story are widely spread among the people. The tale is almost known to every household. Legend has it that Meng Jiangnv’s husband Wan Xiliang was seized by emperor Qinshihuang's army and sent to build the Great Wall. No one knew about his fate. Meng Jiangnv missed her husband so much that she traveled a long distance to the Great Wall, only to find that her husband had died and his remains were buried under the Wall. Not knowing exactly where her husband's body was buried, Meng Jiangnü was in great sorrow. She cried three days and three nights in a row and her wailing touched God. All of a sudden, several miles of the Great Wall collapsed and the remains of Wan Xiliang appeared. The legend about Meng Jiangnv is a typical example of the evolution of Chinese folk culture. The story archetype comes from the legend in the Warring States Period, when Qi Liang of the State of Qi died in a battle, his wife was wailing outside the city wall for ten days, waiting his body to be sent home to the Qi Capital. The wall then collapsed. In the Han Dynasty, due to people's hatred toward Emperor Qinshihuang, the story of "Meng Jiangnv” was created. People of the Han Dynasty believed in the telepathy between heaven and man. They thought man's cries could move God. The Shuoyuan (Garden of Stories) and Lienü Zhuan (Biographies of Exemplary Women) of the Han Dynasty both included the story of "bringing down the Great Wall with tears". In the Six Dynasties, there were lyrics about Meng Jiangnv sending clothes to her husband in the official music collection of the Sui and Tang dynasties. So, the plot of Meng Jiangnv traveling thousands of miles to send clothes to her husband was added to the original story. The story of Meng Jiangnv can also be found in Tang Dynasty poems and Yuan Dynasty songs. The story of "Meng Jiangnv bringing down the Great Wall with tears" reflects the grievances ancient people had about tyrant rule as well as the praise of unyielding women. Another interesting fact is that over the long evolving process of the story, plots representative of traditional Chinese culture have been continuously added in, making the story more widely circulated and known to nearly everybody.